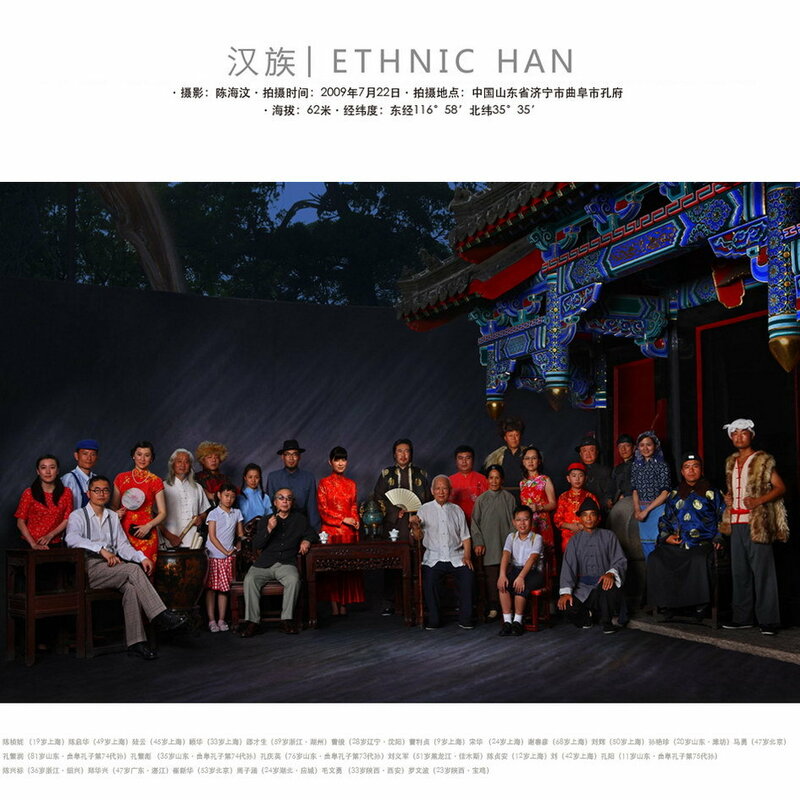 A great series of portraits of Chinese ethnic groups. I think this may be a great resource when reading papers on Chinese genetics and anthropology, as it provides a direct visual snapshot of the groups involved, most of which are probably not familiar to Western readers. Several of the groups have familiar names, so feel free to use the search (on the right of the blog), or click on the labels. to look up posts on them. In case anyone might be wondering, the group photos of PRC Uzbeks and Uyghurs have been taken in the same areas (Ili and Kashgar, respectively) from which Shou et al. (2010) have obtained their samples of these populations that contain very high percentages of J2-M172 Y-DNA. Interesting how "Chinese" looking the Russians are, and the Tajiks. I noticed the Oz Turks appeared less mongolized than those other people. I noticed the Oz Turks appeared less mongolized than those other people. You mean the Ozbeks (Uzbeks)? I suspect dongxiang and bonan too have middleastern influences (j2 hg) as they have developped facial hair and are majoritly muslims. The caucasoid influences on uyghur, uzbeks and tajiks is well known. If you notice well the beard of uyghurs is strong in the chin part but scarce in the cheek part but interstingly the one of the donxiang guy at the far right is well developped both for the chin part and the cheek part. You call those developed facial hair?! They are fluffs compared to the long beards of in some of the Uygurs for instance. Also the Dongxiang and the Bonan do not even look the least bit Caucasoid. Thank you for the post and link. Quite beautiful photos. Aggressive assimilation has been pattern of China history. The non-han rulers oftens themself become sinicized into Han. If Tibetans become Chinese rulers, they would be sinicised even faster which reflects unique nature of Chinese civilization. Assimilation is very conterintuitive to western culture which based on discrimination with ethnic purity like nation of poland or numerous incidence of ethnic cleansing in Europe. Ashraf, these three populations (actually more so for Tajiks and Uzbeks) and Bonan and Dongxiang are poles apart. How can you compare them? Well, unfortunately my screen is too dark for me to distinguish between the edges of the cheeks and black cheek hair. But, in any case, well developed cheek hair isn't unique to non-Mongoloids and hybridized Mongoloids. It is wonderful to see the faces, traditional dress and many aspects of these people's lives: traditional fishing nets, agricultural implements such as wheel barrows, many musical instruments, highly decorated furniture, farm animals, houses, carpets, weapons, looms, carpets, food and even village streets. Each photo lists the longtitude(first) and latitude(second) at the top. You can enter these in itouch map to understand where these people live. We're really not that different. I don't think that discrimination in Europe is all that different from discrimination in China. You can also use latitude and longitude in google maps. Nice pictures, but a lot of staging. I wonder how much emphasis was given to local concepts of "prettyness" versus true local diversity. Almost all groups from low latitudes (<~ 25 degrees as provided) look close to Indonesian, Thai, or Filipino - depending on their longitude. Bai, Jinpo, Lisu, Sui, Lhoba, Daur look disproportionally westernized. Naxi, Tujia, Nu, Sui, Lhoba, Daur look somewhat close to American Native. Naxi, Mulam, Li, Jino, She look somewhat "early - undifferentiated." yes, I too notice European like features in the people from the Northwest of China. It's also interesting to see the cultural features: African looking drums in the groups in northern Burma. I'm still looking at the photos. Yes, they're portraits and quite setup. They're not trying to be documentary style pictures. Still, the families obviously went to a great of trouble to bring into the pictures what mattered to them. So, in a different way, there's quite a lot of meaning there. Thanks for your comments. I'll look for it. Note the woman holding a violin like instrument at the bottom right of the Kazak picture. That's quite significant in that it was women who often played the violin in Persian society. The violin and its variants are thought to Europe from the east. Of course, Kazakstan is on the ancient silk road. In the center of the Qiang picture, there appears to be a grinding stone. I was reading on wiki about these people. There quite a unique bunch. Anyway, it states that millet, highland barley, potatoes, winter wheat and buckwheat form the staple of their diet. ... thought to have come to Europe from the east. Clearly, tea, Persian style, is very inportant to them. The tea pots are very Persian looking, as is the motif on the serving tray at the center of the picture. Native North American like moccasin boots. While hockey is considered to have originated in the First Nations of Eastern Canada, it is odd that the Daur also seem to have their own traditional form of hockey. Woman playing a guitar/lyre type instrument, again in the Persian tradition. Unmistakeable similarities of dress with the Canadian Inuit. Fascinated by the turquoise jewelry the women in this picture are wearing, I checked the wiki page. Check on the hunting bow on the right hand side of the picture. Apparently, the Hezhen are an Altaic speaking hunting and fishing culture. Very interesting about the kayak, which you also find in Na-Dene and Inuit cultures.